Once again, El País newspaper, on its economy section and in the page devoted to properties and design, has chosen one of our promoted houses that are luxurious and singular. Our luxury real estate agency HJAPON, with international presence and the essence of a familiar company, manages real estate in Barcelona, El Maresme coast and some more areas around Spain. The house that appeared on El País is a property for sale in the beautiful town of Alella. It is a modern housewith 3 hectares of vineyards. This majestic property, which is divided into 2 floors, mixes tradition and modernity perfectly. It is located in an unrivalled natural environment, surrounded by vineyards, fruit trees, a swimming pool and breathtaking views onto the Mediterranean Sea. This is an exclusive and special property in the Catalan coastline, ideal for those who are eager to enjoy some sun on the beach or the mountains. 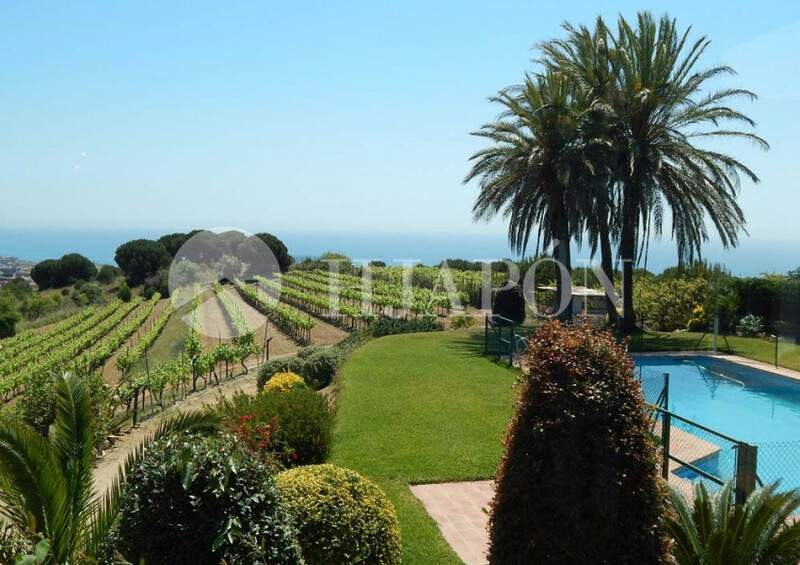 This exclusive villa for sale with vineyards is located in Alella, a town where field, city, mar, mountain, tradition and modernity are perfectly merged into an awe-inspiring environment. Tiana and El Masnou are the closest towns, as well as some other beautiful towns all along El Maresme coast. This excellent house for sale has an excellent location, as it is near the town where all kind of services can be found: shops, pubs, restaurants, sports complex, golf courses, tennis courts, horse centres, etc. There are also some exclusive schools and an international bilingual school. It is also possible to practice some water sports in the near Maresme and Costa Brava beaches or at El Masnou, Llavaneras and Premià de Mar marinas, among others. The exclusive property is also wonderfully connected to Barcelona and Girona’s Costa Brava, either by train or highway. It is also close to El Prat and Girona International airports. Without any kind of doubt the location of this house is one of the most coveted when it comes to singular houses, as it is in a privileged environment that offers everything someone might need.